Wednesday in Stuttgart wasn’t as windy as the previous main draw days, yet almost as cold as we had yesterday, maybe a bit warmer. However, conditions weren’t relevant for the first time at this tournament and many players didn’t want to forfeit their chance to have some good practice on the practice courts. Almost every player was practicing today, even those who lost their matches in singles and doubles. Grass season recently started and not everyone feels comfortable with the grass. Dominic Thiem for example practiced a lot with Lukas Rosol who was also his doubles partner. They were joking a lot and talked about tennis, while working on their forehands. Thiem’s forehand looks a bit better, backhand was a bit worrying though. Thiem really didn’t look happy with his progress at the beginning, but he cheered up with every backhand cross which went on the line. I reckon Rosol is a bit injured, since he didn’t move as well. Dustin Brown and Gilles Simon also practiced in front of fans. Just like Rosol and Thiem they laughed a lot and put on a show with some great shots. Next to them on the same court were Alejandro Falla and Mikhail Kukushkin training, though the Colombian got defeated by Sugita on Sunday. Falla worked on sharpening his game on grass and his backhand got more effective now, he really displayed a much better tennis than he did on the weekend. Especially his backhand slice looks pretty good. Kukushkin on the other side wasn’t as inspiring as the Colombian and appeared frustrated. Rafael Nadal was practicing today and expected his second doubles match. Unfortunately Robert Farah had wrist problems and had to call off (wish you a speedy recovery). His forehand was looking very solid with depth and power. However, his backhand didn’t improve a lot and he needs time to fix it.. He looked very pleased about his training and smiled, he really enjoys the grass-practice in Stuttgart. Francisco Roig looked happy too, as he watched Rafa’s down-the-line forehands land in again and again. Still, one has to admit the conditions made the grass courts very slow and the grass here doesn’t have a low bounce. Marin Cilic got the biggest court to train on, Court 1! 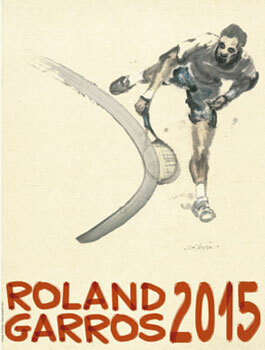 He hit many backhands at practice, trying to fix the shot that bedeviled him in doubles. His cross-court forehand looked to be a strong weapon, but he wasn’t clicking on down the line shots. Alexander Zverev was up in the first match against Viktor Troicki on Center Court and I’m certain that a member of his team watched Troicki’s match yesterday. Zverev employed a strategy more suited to clay than grass, but his gameplan was to stay in rallies and to attack Viktor’s flaws (his almost careless shot selection and his poor groundies). Though the scoreline would indicate otherwise, Viktor didn’t play great Tuesday against Borna Coric hitting many forehand unforced errors, so it wasn’t a bad idea to be more defensive for your second grass match ever if you’re Zverev. Problem was his shots lacked depth and Troicki was able to dictate the rallies like he wanted. Zverev started very bad in the first set losing his serve and having many problems on his second serve. He didn’t find his rhythm at first, and by the time he did, the first set was in the books in favor of Troicki. Second set started similar, problems holding his serve and lost his service again. Troicki hit the balls very well and moved quickly on grass. He was very often at the net, Zverev almost never and he got too passive during rallies, the Serb toyed with him playing the balls back and forth. The young German couldn’t always yield an advantage of his serve today to be more competitive. Troicki served a bit better and returned very much better than Zverev who had problems anticipating the Troicki serve. Troicki had a very good depth today, hence Zverev the younger had to move very often on the baseline and slipped and fell quite often. After a while Troicki lost his focus and was inattentive, he started to prefer the worst option and his shot selection was awful. He lost his two match points in the breaker due to this, and lost the second set with a stab volley right into the net. Once again, in the third set, Zverev had many problems with his serves as he didn’t aim to hit a winner and let Troicki dictate the game. This match was full of very long rallies, seemed to be more a clay event than a grass match in reality. Zverev failed to break Troicki again, and the Serb served it out though with some silly UEs 6-3 6-7 6-3. Gael Monfils routined Andreas Haider-Maurer 7-6(6), 7-6(5), a typical scoreline for a match on grass. Both served very well in the first set, Monfils couldn’t convert the first break point at the first game thanks to an ace the Austrian hit and Haider-Maurer couldn’t convert his break point (which was a set point too) because of a very strong forehand cross winner Monfils hit. Breaker had to decide the first set and the Austrian had a very rare problem: His two foot faults cost him greatly as he double faulted twice. Monfils couldn’t hold the edge with the first mini-break, but converted his next set point on his serve. Second set started like the first one with lots of service winners due too good serves. The Frenchman lost again his concentration and couldn’t break the Austrian. He put up on a show to amuse the crowd after he started to return well. Haider-Maurer had more problems returning, so Monfils didn’t have many problems with his serve apart from a service game. Just like Zverev before Haider-Maurer, a dirtballer, played like on clay, very defensive and cautious. He wasn’t as often at the net with serve-and-volley as Monfils was, but when he decided to take over the rally, he went forward and won it. In contrast to his rival who tried many hot shots and serve-and-volleys, some of them enchanting the crowd. Furthermore, both had problems volleying, since Haider-Maurer waits for these net approaches to pass Monfils and the Austrian went forward after a very harmless shot. Many volleys landed at the net. Gael played very well when he needed to and had an eye on the clear space for the winners. However, breaker had to decide the second set again and the Austrian led with a mini-break, but gifted it right back to Monfils. Then he again committed the first UE to lose his serve after a good return while the Austrian played serve-and-volley. Monfils closed the match of course with an ace. Monfils has promised his fitness trainer the new Mercedes-Benz car if he wins the title. Against Feliciano Lopez, a grass court expert, big serving Aussie Sam Groth notched a huge win. After losing a service game in the first set in routine fashion, he didn’t lose another service game. His match would have been easier if he converted all the volleys and smash opportunities that Lopez offered up. Both were serving fantastically without any big problems they couldn’t handle. Lopez began suddenly to play less slice and more top-spin which helped the Australian a lot and his returns became less hazardous. The Spaniard lost his confidence as the match continued, whereupon Groth gained more confidence in his groundgame which got more threatening as the games went by. Lopez’ surprising slice shots vanished Groth’s rhythm during the second set and so it got very difficult to break him. The Spaniard’s usual return position was a few meters behind the baseline, His distance was even farther away from that line returning in the 2nd set. This wasn’t the best approach against Groth, as Flopez’s passivity in the second set resulted in a losing result unlike in the first. When Lopez failed to get amazing return winners he was going for, Groth didn’t have any problem with his serve-and-volley to win the points on serve. Lopez hit slice and topspin body shots at Groth when the Australian went forward, but Lopez couldn’t repeat this strategy to success execution wise. The second set tiebreaker seemed to be very even for a long time, but after a very good return on the line and a long slice rally Groth hit a miraculous and lucky bh slice in front of Lopez’ feet. Furthermore the ball had a rare bounce, rendering it unreachable. Groth served fantastically well and Lopez didn’t have the ghost of a chance to break him. The third set tiebreaker was more of a nailbiter than even the second set tiebreak, and after Groth’s incredible forehand on the line Lopez’ backhand slice reached the net. Groth served it out without problems and won the match after losing first set 3-6 7-6(5) 7-6(6). Philipp Kohlschreiber posted another routine win in round 2, defeating Jerzy Janowicz 6-4, 6-4. Kohli played very well today and Janowicz couldn’t keep up the level he had in his match against Brown. Kohlschreiber moved very well and anticipated Janowicz’ shot selection well. As a contrast to the Pole, Kohli served with accuracy not just power. Kohlschreiber often played the ball in to stay in the rally, expecting an UE from Janowicz and JJ had no clue how to handle this approach. It was a very one-sided match as Kohlschreiber dominated the whole match and didn’t lose the control of it. Janowicz didn’t have his serve today, so his groundies were even worse, as he didn’t have much confidence during the match. He had a very negative body language as well. The German did everything right: He stood a few meters behind the baseline to return weak Janowicz serves, and pulled surprising returns out of his hat. Jerzy, who moved poorly on the day, struggled with the fact Kohli didn’t give him a chance to gather rhythm. Kohli was able to trigger forehand and baseline shanks out of Janowicz. The Bavarian counter attacked with his power, very clever shot-selection and very good movement. A big quarterfinal match with Gael Monfils will be next for him.